Fleetwood Town have signed winger Dion Charles from AFC Fylde, whose chairman David Haythornthwaite says the deal has left “a very nasty taste in our mouths”. The 20-year-old midfielder has penned a two-year-deal at Highbury to step up three tiers from National League North to League One. The former Blackpool youth player, who scored 18 goals for Fylde last term, will initially link up the club’s development squad. But Haythornthwaite believes the deal is unethical and was only made possible by an administrative error. Fylde state Charles signed a lucrative contract extension in September 2015, tying him to the club for at least another two years. However, that new contract was not received by the FA, in whose eyes Charles was out of contract this summer and so free to move. 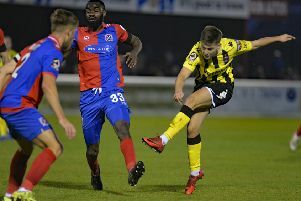 Haythornthwaite admits his club are at fault for not checking the FA had received the paperwork, but he berated both the player’s agent for offering Charles to other clubs and Town for not contacting Fylde before completing the deal. Haythornthwaite says his club began legal proceedings after unsuccessfully appealing to the FA to review the evidence. He also claims that Championship club Nottingham Forest dropped their interest in Charles on hearing Fylde’s side of the story. He said: “When we explained the situation they immediately respected our position and backed off. “However, in the last 48 hours we have learned that Fleetwood have now signed him. I have made my feelings known in no uncertain terms to their chief executive Steve Curwood and their chairman Andy Pilley. Fleetwood issued no immediate response when approached by The Gazette. Earlier in the day, manager Steven Pressley had said he was pleased to recruit another talented young player. Pressley said: “Our scouting and recruitment staff have been to watch Dion. He is another young player we expect we can develop into a first-team player and a real asset for the football club.